Entertainment cannot get better, hotter and more alive than the Houston Rodeo show. Steeped in the Texan culture and yet calling in participants from around the world, the show is a study of traditional art and global entertainment in the modern day world. Reading about it can never be enough. To add to the experience, the management has announced that the stage used at the NRG Stadium for the concerts will be upgraded. The new stage will can lowered or elevated and will be in the shape of a five sided star. You have to see it with your own eyes to really understand what it is like. And for that you have to get hold of the Houston Rodeo tickets as soon as possible. The Houston Rodeo is the world’s largest livestock exhibition, world’s most extensive regular-season rodeo competition and Southwest’s grandest concert festival. It was inaugurated in 1931 under the name of The Houston Fat Stock Show and Livestock Exposition with seven participants exhibiting their stock. In 1938, a horse show, parade and rodeo were included in the event for the first time besides the livestock exhibition. The tradition of concerts and singing began in 1942 when Gene Autry, known as "the Singing Cowboy" entertained the crowds with his performance. The whole program became Rodeo Cowboy Association (RCA)-sanctioned in 1954. Its current name, Houston Livestock Show and Rodeo, was taken up seven years later, in 1961. Some of the interesting events to be held as part of the show were the very first World Championship Bar-B-Que competition in 1974 and a special rodeo program for the Economic Summit of Industrialized Nations in 1990. As the years passed, the event became bigger and grander. Its eighty year journey saw the development of scholarship funds program as well as the construction of the very famous arena known as the Astrodome. The Houston Rodeo presented a progressive front as they kept installing new technology and kept up with the changes of the time. The area of the venue was also increased from time to time as the number of rodeo fans grew by leaps and bound. This was also the reason that its venue had to be changed from Astrodome to Reliant Stadium in the year 2003. Though both venues belong to the Reliant Park, the Reliant Stadium has a greater seating capacity which is more than seventy thousand. The attendance records were broken in 2011 when more than two million people attended the event. The Houston Rodeo follows a particular pattern now. The show goes on for twenty days. It is usually held in winter and spring seasons. It kicks off with Downtown Rodeo Roundup which is followed by the Downtown Rodeo parade, the ConocoPhillips Rodeo Run and then the World Championship Bar-B-Que contest. Other entertaining programs include the Rodeo Uncorked, pig racing, livestock competitions, a carnival and the unforgettable concerts! The show is known for calling in some of the all time greats of the music industry, the likes of Elvis Presley, Bon Jovi, Bob Dylan, Brooks & Dunn, Garth Brooks and Willie nelson, to perform at the venue. In 2012, lineup for music concerts include Brad Paisley, Lady Antebellum, Enrique Iglesias, ZZ Top and Zac Brown Band. So what are you waiting for? Buy the houston rodeo carnival tickets now. One of the biggest and most popular rodeo shows in the world, the Houston Livestock Show and Rodeo is back! This year, the event is going to get even better as some of the biggest stars of the industry will be performing live. The houston livestock show and rodeo lineup has been announced and here are the details. The winner of four Country Music Association Awards, Kacey Musgraves is scheduled to play music live for the fans at the HRSR on February 25, 2019. In 2018, she came out with her most recent studio album, ‘Golden Hour’ which peaked at the fourth spot on the Billboard 200 and earned her nominations for two Grammys. Rodeo Houston will be incomplete without the live performance of Luke Bryan. This multi-award winning country crooner is scheduled to rock the stage on February 28, 2019. Since starting his career in 2007, Bryan has put out four consecutive chart-topping studio efforts including his latest, ‘What Makes You Country’ which came out in 2017. 2018 has been the highlight year for Cardi B as she did not only put out her debut studio album, ‘Invasion of Privacy’ which topped the Billboard 200 but also won multiple AMAs and BET Hip Hop Awards. She is now all geared up to deliver a highly entertaining performance at the RodeoHouston on March 1, 2019. Panic! At The Disco has been on a roll as of late. The group has recorded two consecutive chart-topping studio albums including their latest, ‘Pray for the World’ which hit the markets on June 22, 2018. The album made a huge impact and was included in Alternative Press’s list of, ‘The 50 Best Albums of 2018.’ Panic! At the Disco is now scheduled to set the stage on fire with its performance at the RodeoHouston on March 3, 2019. The former member of Fifth Harmony and the winner of four American Music Awards, Camila Cabello will also be performing live at the RodeoHouston on March 5, 2019. She made her big debut in 2018 with the release of her first solo studio album, ‘Camila’ which topped the Billboard 200 and was certified Platinum in the States. You can now expect her to perform hits from that record live when she takes the stage at the event. The rising country star, Luke Combs burst into mainstream popularity when he dropped his first two multi-platinum singles, Hurricane and When It Rain It Pours both of which topped the Country Airplay chart. He has also put out one studio record, ‘This One’s for You’ which peaked at the fourth spot on the Billboard 200. The fans of Combs will now get to see their favorite star jam live at the RodeoHouston on March 6, 2019. The iconic country megastar, Tim McGraw is also among the list of performers who will play live at the HLSR 2019, making this show a must-attend for everyone. This multi-time Academy of Country Music Award winner is scheduled to perform at the event on March 7, 2019. The multi-platinum selling DJ and record producer, Zedd spent 2018 working on new music and released three singles including, The Middle which featured Grey and Maren Morris. The song earned three nominations for the Grammy Award and went Platinum in five countries. He is now ready to party with the fans at the RodeoHouston and will be performing live on March 8, 2019. The three-time Grammy winning band, Kings of Leon will be seen rocking the fans with their powerful performance at the HLSR on March 12, 2019. It’s been three years since the release of their first chart-topping studio effort, ‘WALLS’ which arrived in stores on October 14, 2016. Since then, they haven’t put out any new music. Chris Stapleton is another major country superstar who is scheduled to perform live at the RodeoHouston on March 14, 2019. Since the release of his breakthrough studio album, ‘Traveller,’ he has put out two more number-one records and has gone on to win seven Academy of Country Music Awards. Garth Brooks Houston Rodeo tickets for the country singer’s upcoming performance are in high demand. The musician’s third album Ropin’ the Wind was the first country record that debuted at the number one spot on the pop music charts. He has sold over than a hundred million albums in his career so far. Don’t miss his live concert. Zac brown band Houston Rodeo tickets for the country act’s much anticipated live performance are now available. Their most recent album to hit the shelves was Welcome Home (2017) that spawned hits such as My Old Man and Roots. Enjoy these and more live at the upcoming show. The What Ifs singer is all set for a live performance at the NRG Stadium, Kane Brown Rodeo Houston tickets for which are now available. Brown may be very young and only two studio albums old in the industry, but he is already ranked among the top musicians in the country genre. Some of his major hits include Used to Love You Sober and Heaven. Brad Paisley Rodeo tickets for the country crooner’s upcoming performance are selling like hot cakes. Paisley made his debut with the record Who Needs Pictures the sales of which crossed the one million mark. His popularity has continued to increase with every new album, the latest being Love and War which came out in 2017. Catch him live in March at the NRG Stadium. These are not the only stars that will perform live at the Houston Livestock Show and Rodeo 2019. Other acts including, Brooks & Dunn, Old Dominion, Kane Brown and Santana will all be playing live at the event. So, if you want to attend this then simply get your hands on Rodeo Houston 2019 tickets. Currently the average price for Houston Rodeo tickets is $337. The date and location for this event is 17-Mar-19 at NRG Stadium, Houston. The minimum get-in price for Houston Rodeo tickets is $28. Q:How Much Are Houston Rodeo tickets for its event on March 6, 2019? A:Our authentic brokers are currently selling Houston Rodeo tickets for its event on March 6, 2019 at an average price of $91. However, there is no need to worry as you can also buy these tickets at the get-in price which stands at $17 as of now. Before you decide to buy the tickets please remember that these prices are not fixed and may change in the future as our website operates like a live market. Q:Can you please give me some information regarding the HLSR dates? A:Of course! Houston Livestock Show and Rodeo is scheduled to start on February 25, 2019. The spectacle will run till March 17, 2019. Please note that all of the HLSR shows will be performed at the NRG Stadium. During these shows, a lot of famous stars will also be performing live including Kacey Musgraves, Brooks & Dunn, Luke Bryan, Cardi B, Camila Cabello, Tim McGraw and many more. Q:Are you offering any discount on Rodeo Houston tickets? A:Unfortunately, no! Our trusted brokers are currently not offering any discounts on Houston Livestock Show and Rodeo tickets. However, there is nothing to be worried about as our brokers have already made these tickets available at an affordable price. So, get them now if you don't want to miss out on this epic event. Q:Is it possible to view the seating chart of Houston Rodeo tickets? A:Yes, of course it is possible. To view the seating chart, simply search for Houston Livestock Show and Rodeo tickets on the event's page. Once you have the find the ticket that you want to purchase, click on the option 'View Tickets.' This will take you to a new page which will display the seating chart of that particular ticket along with the pricing details of each seat. Q:On which date will Zedd perform at the Houston Livestock Show and Rodeo? A:The Grammy winning DJ and record producer, Zedd has been announced to perform at the Houston Livestock Show and Rodeo on March 8, 2019, making this event even more special for everyone. So, if you want to attend this show live then purchase your Houston Livestock Show and Rodeo tickets from our registered brokers. Q:Will the tickets for Houston Livestock Show and Rodeo 2019 be cheaper if I buy them now instead of near the show day? A:The prices of Houston Livestock Show And Rodeo Tickets are likely to be cheaper well before the event. As the event dates come closer, the demand of these tickets is expected to go higher. Hence it is recommended to buy your tickets as soon as you find a good deal. Q:Do the tickets to 2019 Houston Rodeo include any extra charges? A:You will be charged the price that is mentioned on our website and nothing beyond that. There will be no extra charges on your purchase of Houston Rodeo Tickets. Q:From where can i get deal details of cheap rodeo tickets 2019? A:You can get deal details of Houston Rodeo Tickets on our page. Check it out and place the order right away. Q:Do you still have 2019 houston rodeo tickets? A:Yes, The HLSR event is scheduled to start soon and tickets for it are selling like hot cakes. Our brokers still have some very good deals so avail them at the earliest. Q:Can I have my Houston Rodeo 2019 Tickets refunded? A:The biggest rodeo show on the planet is now here and you can book your Houston Rodeo Tickets to be a part of it live. As far as refund of tickets is concerned, we are sorry but that is not allowed since the purchase once made is considered final. Refunds are allowed in case of some very rare instances. Feel free to go through the "policies" page of our website for more information regarding cancellation and refund of tickets. Q:At what price are you offering discount Houston rodeo 2019 tickets? A:The price list of Houston Rodeo Tickets is published on our page. As of now, the average price of these tickets stands at $56 while the minimum get in price is $8. Q:Are you offering discount on 2019 Houston rodeo tickets? A:Yes, the discount offer on Houston Rodeo Tickets is still active. Check out the instructions and place the order as early as possible. Q:Are you offering a good seating arrangement with cheap Houston Rodeo tickets 2019? A:Yes, we are offering discounted Houston Rodeo Tickets and a comfortable seating arrangement. Check out the map, choose your seats and follow the simple instructions to place your order. Q:Are the houston rodeo dates 2019 final? A:The Houston Livestock Show and Rodeo 2019 dates have been officially announced. The event will kick off on February 25 and will go on until mid March. You can find the complete itinerary on the event page. Q:Are houston rodeo tickets 2019 available already? A:Yes, Houston Rodeo Tickets are available and that too on discounted rates. Get them as early as you can. Q:Who are the main performers at the rodeo houston carnival? A:Having been staged for over 80 years, the Houston Livestock Show and Rodeo is the most attended festival in the city. This year's lineup includes Cody Johnson, Chris Stapleton, Luke Bryan, Kacey McGraves, Kings of Leon and Zac Brown Band among others. Please browse our website for the complete lineup. Q:Can I get Houston Rodeo tickets for free? A:Sorry but you cannot get Houston Rodeo tickets for free from our website. Nonetheless, you can find good deals and affordable rates offered by our very trusted brokers. Q:Is Kane Brown performing at the Houston Rodeo 2019? A:Yes the American country music singer and songwriter will be performing as part of the Houston Rodeo at the NRJ Stadium on March 9, 2019. Q:Do you have a discount for Houston Rodeo tickets on your website? A:Yes we do. On the event page you will find Event18 promo code using which you can get a great discount on your purchase of tickets. Q:At what price are you offering tickets for Luke Bryan Houston Rodeo performance? A:Currently you can find tickets to Luke Bryan's Houston Rodeo performance at an average price of $104 while the get in price of the tickets stands at $26. Please remember that prices of tickets on our website change on an hourly basis. Q:Can you tell me when does the Houston Rodeo event start? A:Yes Of Course. The much anticipated event will be held at the NRJ Stadium in your city, with the first performance being that of Kacey McGraves on February 25, 2019. Music lovers have already started making their bookings. Q:Do you have Kacey McGraves tickets for her Houston Livestock Show and Rodeo performance? A:Yes. We do have Houston Rodeo tickets for Kacey McGraves' performance at the NRG Stadium in February. As of now the average price of tickets to this performance is $97. Q:How can I access the Houston livestock show and rodeo seating chart? A:Interested in buying Houston Rodeo Tickets? First we must tell you that you need to act fast as the Houston Livestock Show and Rodeo is one of the most popular events in the city. Even though it's spread over 20 days, the attendance increases almost each year. You can view NRG Stadium's seating chart on our website by clicking on the 'View Tickets' button. But you will need to confirm beforehand with our sales representative whether your desired seat is still available or not. Q:Is there any such thing as houston livestock show and rodeo season tickets? If yes, where can I get them from? A:If by Season Houston Rodeo Tickets you mean a package deal for the 20-day run, then sorry there is no such deal. Since various artists are headlining on different dates, the tickets price varies according to that. Interestingly, the most expensive average ticket price on our website is for March 10 event, when Alicia Keys is the main performer. You can browse through our inventory and select the date and artist whose performance you want to attend the most. Q:What time is it in Houston Texas when the Houston Livestock Show and Rodeo starts? A:The Houston Livestock Show and Rodeo will take place for 20 days from March 7 – 26, 2017 at the NRG Park. According to the event's official website, the weekday performances will start at 6:45 p.m; whereas the weekend performances will begin at 3:45 p.m. With Houston Rodeo Tickets you can watch thrilling rodeo competition and live music performances by stars like Luke Bryan, Chris Stapleton and Old Dominion. Q:Can you please tell me when does the rodeo end in Houston? A:One of the most anticipated events in Houston, the Houston Livestock Show and Rodeo is spread over 20 days. The event will kick off on March 7 and will end on March 26, 2017. NRG Park will host the best tradition in Texas that has been taking place for the past 80 years. Houston Rodeo Tickets holders can enjoy thrilling rodeo action as some of the best riders compete in the event. The grand event also features top-class musical performances headlined by stars like Sam Hunt, Thomas Rhett, Alicia Keys and Chris Stapleton. Q:Do you have Houston Rodeo Livestock show tickets? How much are they for? A:Yes, our website is now offering Houston Rodeo Tickets in a wide range of prices to choose from. Kindly browse through the event page and purchase the tickets that are most affordable for you. Q:How to get cheap tickets to houston rodeo? A:Houston Rodeo Tickets are already sold at low rates on our website and if you want to enjoy further discount, you can find and enter the discount code before submitting your order. Q:Where can I get the best tickets to get for the houston rodeo from? A:You can get a good deal on Houston Rodeo Tickets from our website as we offer relatively low prices. Q:What is the price range of cheap houston rodeo concert tickets? A:The price range of Houston Rodeo Tickets is given on our page with special discount codes. Use them and place the order before it is too late. Q:Are there any delivery charges for blake shelton houston rodeo tickets? A:Delivery charges are included in the price of Houston Rodeo Tickets. There is no additional cost. Q:Till when can i get cheap rodeo houston tickets? A:You can get Houston Rodeo Tickets on cheap rates till the date of the event. Check out the instructions and place the order right away. Q:How can i get discounts codes for rodeo houston tickets? A:You can get discount codes for Houston Rodeo Tickets by following simple instructions on our page. Check out the details and place the order. Q:Is the online purchase of cheap tickets to the houston rodeo safe? A:Yes, we are certified by trusted authorities and allow the exchange of Houston Rodeo Tickets in a secure environment. Q:Are you still offering cheap houston rodeo tickets jason aldean? A:Yes, the discount offer on Houston Rodeo Tickets is still active. Check out the directions and place the order right away. Q:Can you find me cheap rodeo ticket? A:You can buy Houston Rodeo Tickets at cheap prices right here from our website. Look through our page for details and order your tickets right away. Q:Are you still offering discount blake shelton houston rodeo tickets? A:Yes, the discount offer on Houston Rodeo Tickets is still active. Check it out and place the order right away. Q:Till when can i get discount houston rodeo tickets? A:You can get Houston Rodeo Tickets on discounted rates till the date of the event. Check out on th instructions and place the order right away. Q:I am looking for 45% discount tickets to rodeo. What percentage are you offering? A:We are offering Houston Rodeo Tickets with a reasonable percentage. Check it out and place your order right away. Q:Is it safe to get cheap rodeo houston tickets? A:Yes, we are certified by trusted authorities and allow the exchange of Houston Rodeo Tickets in a safe environment. Q:I want to buy cheap rodeo ticket houston. Can i buy that from your website? A:Yes, you sure can buy cheap priced Houston Rodeo Tickets from our website. Look through our page for details and you can order your cheap tickets from there. Q:I want to buy houston rodeo discount ticket. Do you have them? A:Yes, we do have Houston Rodeo Tickets available at discounts. Use the discount codes mentioned on our page to get discounts. Q:Till when can i get discount tickets for houston rodeo? A:You can get discounted Houston Rodeo Tickets till the date of the event. Check out on the instruction and place the order right away. Q:How long does it take to get discounts after using houston rodeo offer code? A:You can get discounts instantly after using the discount codes of Houston Rodeo Tickets. Q:How can i get rodeo houston tickets code? A:You can get discount codes of Houston Rodeo Tickets by following special instructions on our page. Check it out and place the order right away. Q:Can you please tell me my rodeo discount code? A:To get Houston Rodeo Tickets discount code, you can call our help desk. Q:Good morning! Can I find cheap zac brown tickets houston rodeo from this website? A:Definitely! Houston Rodeo Tickets can be found at the most affordable price on our website. Buy now! Q:What if I need cheap jason aldean at houston rodeo, is there any way I could find them online? A:Definitly! Houston Rodeo Tickets can be purchased from our website instantly. Q:If I buy 10 tickets cheap jason aldean rodeo houston tickets cheap then would you allow me to pay in cash? A:You can purchase as many Houston Rodeo Tickets at a low price from our website, however, cash payment is not an appropriate mode of payment for the tickets as per our policy. Q:Where is the discount code houston rodeo tickets can be found out from? A:You can get your Houston Rodeo Tickets discount code by calling our live operator. Q:Hiya! Can you please tell me about janet jackson rodeo ticket discount code? A:Yes. Houston Rodeo Tickets discount code can be found out easily by calling on our help desk. Q:Is there any special discount being offered on Houston rodeo tickets at excite? A:Houston Rodeo Tickets do have a discount code. To find out about the discount code details, contact our live help desk. 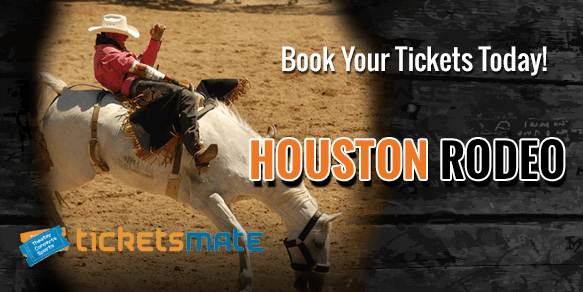 Q:Are there any Houston rodeo tickets available at excite? A:Yes. The Houston Rodeo Tickets are available for sale on our website. Q:Do you have cheap houston rodeo tickets? A:Houston Rodeo Tickets are with us at really affordable prices so go for it. Q:I need to buy cheap houston rodeo tickets? A:You can have your Houston Rodeo Tickets from our list of options. Q:I need lady antebellum rodeo tickets houston? A:Pick you desired Houston Rodeo Tickets from our list of options. Q:I need some houston rodeo tickets? A:You can order our choice of Houston Rodeo Tickets from our list of options.